Fellow of the Royal Entomological Society. Member of the British Arachnological Society. Member of the Peninsular Invertebrate Forum. Chairman of the Peninsular Invertebrate Forum and editor of the Forums Bulletin . Member of Council of the British Arachnological Society (1999 - 2007). Editor of the Royal Entomological Societies Bulletin, Antenna. I have always been fascinated by the ecology of invertebrates, but it is the arachnids that have been the main focus of my recent work. My main areas of interest are the ecology of cave invertebrates, interactions between humans and invertebrates in their homes. I also have a keen interest in stimulating the next generation of invertebrate biologist by interacting with local schools and youth organisations. My other passion is to explore the links between art and science. Viewing the historical links between the two cultures and using the arts as a vehicle to take science to a wider audience. I also try to use science as a source of inspiration to stimulate an interest in science amongst the arts community. This was produced and performed by Electric voice Theatre and is currently on tour around the UK. A contemporary Dance production that draws inspiration from insect behaviours and life cycles. This is a collaboration between the University of Plymouth and the Barbican Theatre, Plymouth. It was partially funded by BBSRC. Peter Smithers was a scientific advisor and performer in this production which was part of the Theatre Royal’s Theatre of Science program. The performances explored the nature of human emotions, with each act being presented as a scientific experiment. The performances were directed by Gecko Theatre company and funded by the Welcome Trust. A series of insect inspired film with a conservation message. 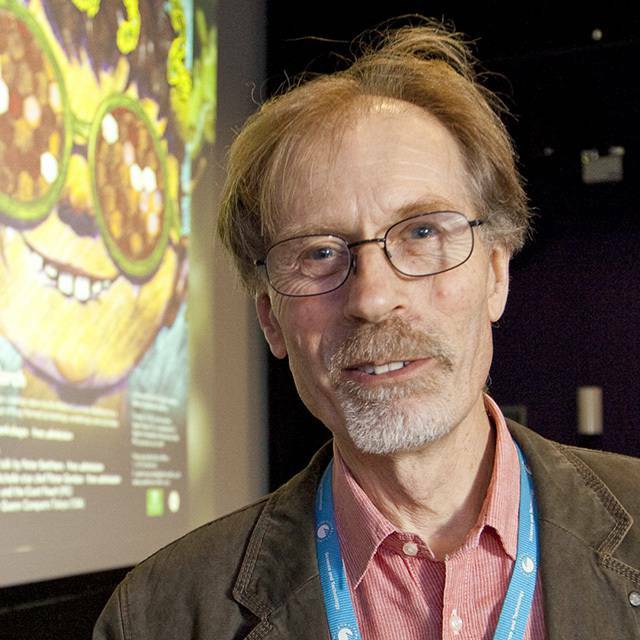 Film Nights at the European Congress of Entomology August 2014, York. A film festival that focused on insects in cinima. Pre film talks and a host of entomologicl activities acompanied the films. Facing up to beetles. Digital images of beetle faces from Michael Derby. May to July 2014. Exploring the microcosm. A short history of the way that science has imaged invertebrates. From 17th century paintings to modern £D scanning Electron Micrographs. April & May 2014. Facing up to beetles. An exhibition of images of beetle heads by Artist Michael Derbey. Beetlemania Plymouth City Museum. July to Septembre 2012. An exhibition that explore the ways in which beetles are percived, been presented and imaged. From scientific study to cultural icons. Supported by Peninsular Arts and the Royal Entomological Society, this exhibition explored the many ways that contemporary artists had interpreted the insect world. It featured work from 40 artists, mostly for the UK but with contributions from Europe and the USA. A catalogue was produced which is available from the author and the Royal Entomological Society. A look at the roles that insects play in the running of our world. It also focused on the activities of local entomologists. This was collaboration between the University of Plymouth and Plymouth City Museum. November 2005 – January 2006. Insects and Art November 2005. An exhibition and conference that explored the use of insects in western art, from a contemporary and historical perspective. The exhibition featured the work that ranged from the illustrative to the conceptual from 8 artists that are based in the SW. It also featured a number of digital reproductions of plates from 17th centaury entomological texts. Linked to this event were a series of insect drawing master classes run by local artist John Walters. These were aimed at 6th formers studying either biology or art. (November 2005). .An interactive exhibition which examined invertebrate diversity, and looked at what the world would be like if various group of invertebrates were missing. It formed part of the Universities Weird Worlds Venture. Peter Smithers & Karen Gresty (). Marvellous Minibeasts. A multi disciplinary exploration of the insect world. Ruan Minor, Cornwall (June 2004). This was a week long event were scientists worked with artists, dancers and dramatist to examine the lives of the insects in the local countryside. The event was coordinated by Creative Partnerships. The Amazing world of insects and other minibeasts. An interactive session at the British Associations for the Advancement of Science. Annual Science Fair. (2004). In collaboration with Karen Gresty and Jacolly Puppet Theatre. This project was funded by a grant from BBSRC. Pseudanapis aloha Forster (Araneae, Anapidae) from the Eden Project in Cornwall. Snazell & Smithers. (2007) Bulletin of the British Arachnological Society. 14 (2). The Diet of the Cave Spider Meta menardi (Latreille 1804), (Araneae-Tetragnathidae). (2005)The Journal of Arachnology ,(33) 2. The early life history and dispersal on the cave spider Meta menardi. (2005) Bulletin of the British Arachnological Society. (13) 6. Notes on the Spiders in the Humid Tropic Biome at the Eden Project, Cornwall(2004). Peter Smithers Catherine Trodd & Elizabeth Lane. Newsletter of the British Aracnological Society (101). New Records of Red Data Book spiders from south west England. (2004) Newsletter of the British Arachnological Society ,(100). Myriopods as prey of the cave spider Meta menardi. (2004) Bulletin of the British Myriopod Group (20). Peter Smithers, Catherine Trodd & Elizabeth Lane. Bulletin of the Devon Invertebrate Forum (10). The Rare Spiders of Devon & Cornwall.Part 1 Red data Book species. (2002) P Smithers. .Bulletin of the Devon Invertebrate Forum (8). Entomology in Superstores. (2002) RJ Hekford & P Smithers. Bulletin of the Devon Invertebrate Forum (9). Macro-arthropod communities of the giant rosette plant Espeletia pycnophyll subsp. angelensis. Smithers P. Ramsay P. Bond A. Burns M. in The Ecology of Volcan Chiles, High-altitude Ecosystems on the Ecuador-Colombian Boarder . (2001) Ed. P.Ramsay. Pebble and Shell Press. Variation in paramo invertebrate communities on Volcan Chilase, with particular reference to Carabidae (Coleoptera). Smithers P & Atkinson N. in The Ecology of Volcan Chiles, High-altitude Ecosystems on the Ecuador-Colombian Boarder. (2001) Ed. P.Ramsay. Pebble and Shell Press.145-154. A Provisional Key to the Families of Spider from Paramos on Volcan Chiles, Ecuador. P. Smithers. The Ecology of Volcan Chiles, High-altitude Ecosystems on the Ecuador-Colombian Boarder. (2001). Ed. P.Ramsay. Pebble and Shell Press. 137-144. Flies as a Domestic Nuisance. Environmental Health Implications. (2001) Peter Smithers & Nigel Ramsey. Environmental Health Journal. Vol 108/07, 220-221. Something Coleopteran this way comes. Antenna, 2016. The Magic and Mystery of Devons Spiders. Margins magazine. April, 2010. Gardians at the Gate. Spiders in Cornwall. in Regina in Cornwall July 2007. As part of the Social Systems exhibition at Tate St Ives. Art in the Undergrowth, Insect Aesthetics. Art in Devon, Summer edition 2006. Gardians of the Underworld. Decent (Caving magazine) July 2005. The Great Minibeast Hunt. (July 2005) Peter Smithers & John Walters. Devon Today. Minibeasts in the Garden. (2004) Peter Smithers & John Walters. Wild Devon (Autumn edition). Are Entomologist Heading for Extinction. (2004) Antenna (28)4. Taxing Taxonomy, Scary Systematics and Confusing Clasification; Interactive activities to make scientific jargon more assesible. Peter Smithers, Jan Freedman, Claire Buckland, Helen Fothergill, Rob Langworth, , Elaine Fileman and Jodie Fisher. A chapter in "Science Exhibitions". Comunication and evaluation. Ed. Anastasia Filippoupoliti. Museumtech/ Edinburgh. 2010. The Arachnids in Red Data Book for Cornwall and Isles of Scilly, 2nd edition. Croceargo Press. 2009. Minibeasts, an Identification Guide (2004). An introduction to the commonly encountered invertebrate groups. The book is aimed at the 8-12 age group. Illustrated and produced by John Walters. Various species accounts in :The Provisional Atlas of the spiders of Great Britain. (2001) Ed P Harvey. Biological Records Centre, Huntingdon. Minibeasts. 2004. Written by Peter Smithers, illustrated and produced by John Walters. A guide to invertebrates for young entomologists. The Arachnids , in The Recorders Hand Book. Cornwall and the Isles of Scillies. Federation of Biological Recorders. (2000) Ed. M. Atkinson. The Arachnids, in the Red Data Book for Cornwall and the Isles of Scilly. (1997) Ed A. Spalding. Croceargo Press. Life in the Undergrowth, BBC. The Ultimate Guide to Spiders. Discovery Channel. Is Arachnology going Extinct. International Archnological Congress.Gent, Belgium (2004). In Shelobs Lair, the Biology of cave Spiders. (2003) Hidden Earth Conference. An Englishman in the Andes. Insect Collecting on the roof of the world. Plymouth City Museum, Devon wildlife Trust (Tavistock), The Jersey Society (St Helier) (2004). The Natural History of Spiders. South Brent Natural History Society, Devon Wildlife Trust (2004). Insects as Human Food. At the Weird Wolds Exhibition, (Plymouth City Museum 2003), Jersey Society (St Helier, 2004).